Are you new to essential oils? Now sure where to apply essential oils? I'm here to share a few tips to help you figure it all out. Essential oils aren't difficult to use - there are just a few things you need to know about applying them. Once you understand a few simple principles about essential oils you'll wonder why you ever worried! Learning where to apply essential oils isn't that hard to figure out. Drop, dilute, apply. It's pretty simple (just remember to always dilute your oils!). Even better, there are lots of places on your body that you can apply the oils. Inhale directly from the bottle (or diffuse) - this is the quickest way to benefit from your oils. Apply right at the location - if you have a headache, some sort of pain, or other issues, diluting and applying right where it's needed may be best. Apply to the outside of your ears for quick absorption (just remember - don't put the oils in your ears). "Hot" oils for short term use (like Oregano or Thieves) may be applied to the feet (don't forget to dilute). Behind the ears or on the neck or wrists are great places to apply oils for personal diffusing (when you want to benefit from the aroma and the application). No matter where you apply your essential oils -- don't forget that you need to dilute them. 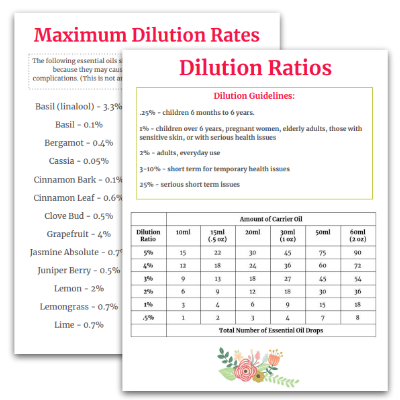 Read this post for all the details about diluting essential oils. 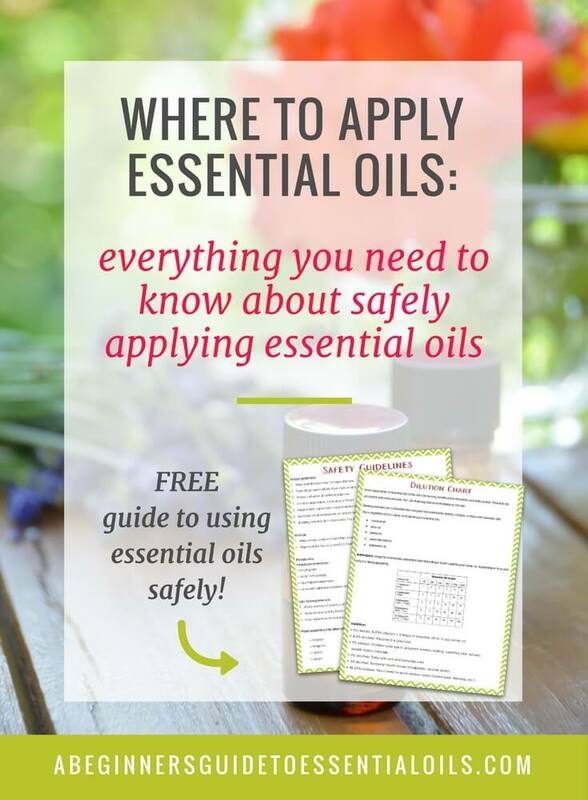 Put your email address in the form below to join the community & learn how to create a healthy home with essential oils - and learn what you need to know about safely applying essential oils. If you'd like to increase the rate of absorption, layering two oils or an oil and a blend can achieve that goal. It can also be a nice way to create a specific blend for your own needs and increase the potency of the oils. To layer the oils, apply the first essential oil, rubbing it into your skin, before applying the next oil, along with a carrier oil (a carrier oil is simply a vegetable oil that is used to dilute essential oils so they are safe for everyday use). Dilution is very important so you will need to keep a few carrier oils on hand. Always remember to dilute! You can use a carrier oil like almond oil or jojoba oil with a few drops of essential oil. What if an oil causes a reaction? Essential oils can sometimes cause a skin reaction for a variety of reasons - it could be a "hot" oil that needs heavy dilution, you may have cosmetics or lotions that cause a reaction, or it could be a photosensitive oil. Overuse of one essential oil (applied topically) can even cause contact sensitization. If you develop a rash, nausea, or a headache stop applying the oil and try a different one. A few essential oils are photosensitive - meaning that they react to sunlight. They should not be applied to skin that will be exposed to direct sunlight. So if you plan to apply any of these oils, make sure you apply them in locations that won't be exposed to the sun (or just plan on diffusing them). Photosensitive oils can cause a rash, discoloration or pigmentation, or even burn the skin so please use caution when applying photosensitive oils. Topical application of essential oils seems fairly straightforward. But, besides direct application, there are a few other ways you can use essential oils topically -- more unique ways to use essential oils. Apply the oils using the direct application technique (don't forget to dilute!). Soak a washcloth in very warm water then wring out. Place on the application area and cover loosely with a dry towel to seal in the heat. Leave the cloth for 10-30 minutes. If you experience any discomfort remove the cloth immediately and apply more carrier oil. If you are treating an inflamed or swollen area, you'll want a cold compress instead of a hot compress. Use either cold water or an ice pack to reduce the swelling or inflammation. Is there a topical application method that you prefer? Applying essential oils topically is an excellent way to enjoy the benefits of your essential oils. And, through trying these different methods and learning where to apply essential oils, you'll discover the ways you are most comfortable with (and confidence is always a good thing!). Essential oils have some great everyday uses and once you begin learning how to use them, following these simple guidelines, you’re on your way to creating a healthier home and body.